No Easy Answers is the third novel in the "Red Light Trilogy" by Beckett and Powers. The first novel in the series, One More Mountain, was gen, and can be found on the Starsky & Hutch Gen Archive. The second novel in the series, One More River, is also slash, and can be found on this archive. 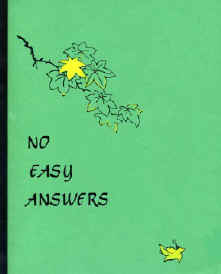 No Easy Answers was published in 1988. As I do with most zines, I will be presenting the novel as it appeared in the zine, including the editorial and other introductory material that was originally in the printed version, including the zine's art. No Easy Answers was originally produced on a typewriter, and had to be scanned into an electronic format, then proofed. Special thanks and a bouquet of roses to SHaron for all her work bringing classic SH fiction to the online community.